Despite the clinical success of modern metal-on-metal articulations, concerns with wear-related release of metal ions persist. 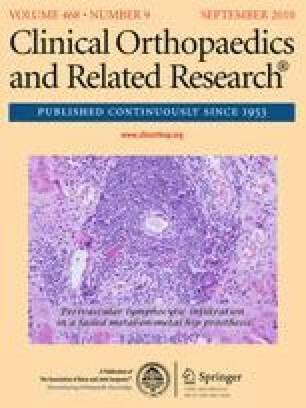 Evidence suggests metal ion release is related to the effective coverage of the head in the metal shell (the cup’s functional articular arc). A recent study suggests a reduced functional articular arc is associated with increased ion release and the arc is a function of component design, size, and the abduction angle. The purposes of this study were to (1) measure the functional articular arc in different sizes of currently available one-piece metal shells from several different manufacturers; and (2) compare the functional articular arc of these one-piece metal shells with the 180º arc of conventional hip arthroplasty acetabular components. We calculated the available articular surface arc for 33 one-piece metal cups using measurements of cup depth and internal cup radius. The arc of the articular surface varied among manufacturers and generally decreased with decreasing shell diameter. The mean functional articular arc was 160.5° ± 3.6° (range, 151.8°–165.8°), which was less than the 180° arc of a conventional acetabular component. Our data show certain cup designs are at higher risk for failure as a result of the decreased articular surface arc. This, along with analysis of abduction angles, supports the recent findings of bearing failure with vertically placed implants. Care must be taken when implanting these shells to ensure they are placed in less abduction to avoid edge loading and the potential for early bearing failure. One or more of the authors (WG, BS, TF) received funding from research endowments from The Winkler Fund and The Smith Arthritis Fund. This work was performed at The OrthoCarolina Hip and Knee Center in conjunction with The OrthoCarolina Research Institute and the Department of Mechanical Engineering, University of North Carolina–Charlotte, Charlotte, NC, USA. We thank Christi Sychterz Terefenko, MS, for her assistance with the manuscript.